Happy-less-than-2-weeks-til-school-starts! 2 weeks from yesterday we’ll be up again by 6:30 and on the interstate by 7:15! I have to say I really enjoy the laziness of summer. I LOVE to sleep in! Today when I got up I found Mallory eating a wonderful breakfast she had prepared all by her 4 year old self (yogurt and “granilla” as she calls it). I must admit…yesterday there was a small teeny tiny part of me that was ready for school to start back. I will retract that statement come August 16th and it was just a fleeting thought as my kids were bugging about going outside in the 95 degree heat or doing something for the 28th time. I unpacked the school uniforms a little while ago to see what of Browder’s might fit G-man for Kindergarten. I can’t believe I will have 2 in “real school”!!! SCHOOL!!!! Monogram Wizard Plus ~ you all probably know I have it, love it, encourage it, etc. When I bought my machine back in 2007, I quickly learned that the 5 fonts that come on your standard embroidery machine are simply not enough. I chose Monogram Wizard Plus and have never looked back! It comes with like 55 or more fonts and I purchased several of the extra Alpha Paks along the way. Now they have the online store where you can purchase and download fonts to use in MWP instantly (they also have sales so don’t let the prices scare you). There are LOTS of programs out there. I’m not saying MWP is the only way to go. All I can say is that I love it and I suggest you take advantage of the trial offer if you are considering it, THEN you can decide! Check out Needleheads for any and all MWP info. p.s. Master Circle is a must have MWP font! Now….. I’m in several “groups” on Facebook and one is for MWP users. One of the members of the group shared the neatest trick so I had to pass the tip along! If you have MWP, then you may have experienced this with certain names/letters/fonts. 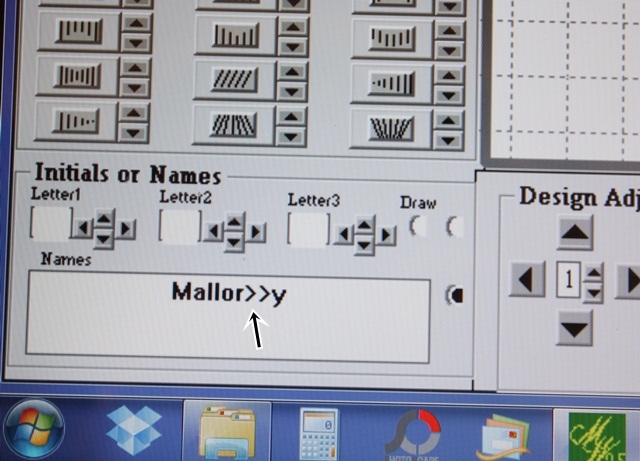 You type your name in, and say the first letter is 1″ from the rest of the name (like M allory). Or, as you can see below, for some reason the “r” and “y” overlap for no apparent reason. There is a trick!!!!!! I used to try to break the name in to layers so that I could control how it all lines up, but not anymore!! ?? Not sure what makes this happen?? You can use the Kerning feature to move ALL of the letters closer together or farther apart from one another. BUT, if it’s just 2 letters that aren’t coming out right or if your first letter (of the name) is too far from the rest of the name, then simply type in “>”, “>>”, “>>>” (however many you need ~ play around w/ it) or “<“, “<<“, “<<<” etc. and then “draw” the name again. So I entered in a couple of “>>” (right above your right ALT key) in my name between the r and y. As you can see it spaced the r and y correctly! I tried to find a better example of how sometimes, for example, the M in Mary is spaced too much away from the “ary” (M ary). I couldn’t find an example of course. 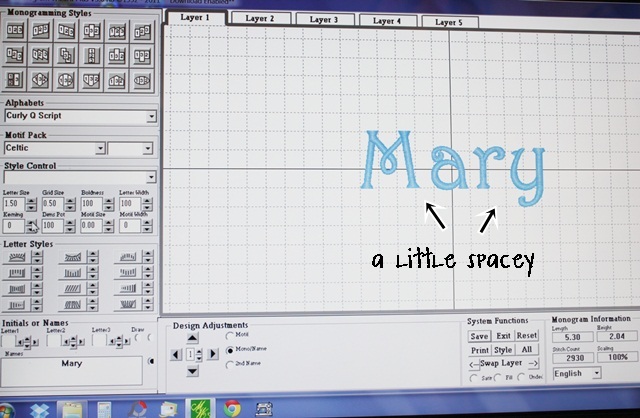 This is regular “Mary” ~ Letter Size 1.50″ – everything is default and normal. It’s a little spacey, so in this case I changed my Kerning to move ALL of the letters closer together. This is after setting my Kerning to 5. (Kerning is the process of adjusting the spacing between characters in a font. Kerning adjusts the space between individual letters.) As you can see all of the letters are closer together. I can also move the M a little closer to the ary with my “<<” trick. As you can see below it is spaced just about right. I could have increased my Kerning another point or two, but most likely the a, r and y would be overlapping or too close together. So, using the < trick worked in this case. I hope this makes sense!! It’s a great trick for names. As far as initials, you can move them around with the arrows beside each letter (on top of where I entered my name) (see Letter1, Letter2, Letter3 for initials – to the right of each are arrows to adjust your initials as needed). Again, if you are interested in Monogram Wizard Plus, download the 30 day trial and try it out. Also, check out FAQ on their website and do your research. There are also groups on Yahoo and Facebook. Thank you again to AWB for posting this tip on the Facebook Group! J’s are a tough initial too! Glad this might help! Thank you for sharing this very helpful tip! I ditto your comments about Monogram Wizard Plus – after purchasing I have never looked back. The folks at Needleheads are very nice and helpful. THANK YOU , THANK YOU, THANK YOU. This has been driving me crazy two years. I have tryed all different ways to correct the spacing. I am so glad you shared this information!!! This has happemed to me a few times and I just blew it off to “I guess it is suppose to look like that with that font or letter combination”! I really didn’t know but never tried to correct it. I also didn’t know about the kerning…never heard that word before today. I do LOVE MWP but I have never really read a manual and I just went with it and tried to figure little things out as I went. Thanks for sharing! Your blogs are very helpful so please don’t feel like they aren’t! I love to learn new things…especially those little tricks that make my life easier! I appreciate your hard work and the information! OMGoodness!! You don’t know how H-A-P-P-Y I am that you posted this!! What’s the Facebook group for MWP, I need to join 🙂 Thank You this will be SO MUCH help! Thanks for the helpful hints for MWP. I have run into problems with this before, tried layering, even changed Font to get one I am satisfied with. This will be less frustrating. Thank you so much! I also used the layers to straighten the lines and just had this issue last night. Love the MWP and would love to join the facegroup also. Love your blogs also!! Thanks so much for the tip! Had it several years and didn’t know how to fix the problem. Thanks for the great tip, Rosemary….I haven’t read the Yahoo group because I was out of town for a week…this is a treasure! Thank you Rosemary! Such wonderful information and I think we all agree that this has been most helpful. 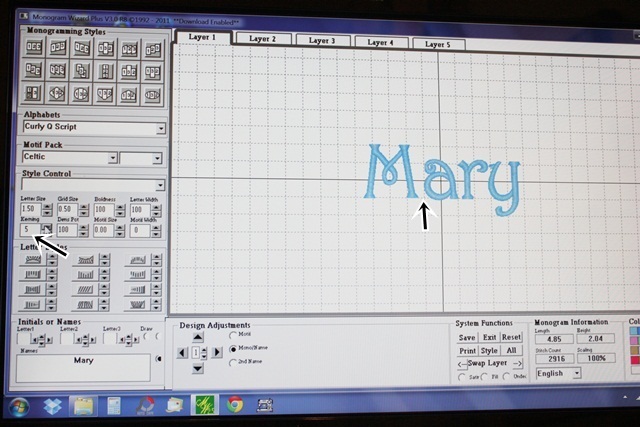 Rosemary, Could you please explain how the overlay works on Monogram Wizard Plus? When would you need to use it. And thanks for your help in explaining the spacing and the kerning of the letters. Thanks, thanks, thanks. I have had MWP since 2006 and some of the fonts I never used for the spacing problems. This allows for more usage of fonts. Again, thanks. Thank you so very much!!! I love my monogram wizard plus especially with the “extended features”. I bought many of their fonts and have NEVER been unhappy. Living less than an hour away from their offices has allowed me to take a couple of their classes. I learned so much!!! They said they were doing some tutorials for the internet. Watch their website (Needleheads.com) for information. I sent a request to join the Facebook group (hope I’m approved). I could not find a Monogram Wizard group at Yahoo. Can you tell me more about this group? I also LOVE your site!!! I’m not sure about the Yahoo group. I think I read on the FB group page that there WAS a yahoo group but I’m not on it. I’ll try to find out! I love MWP too! I knew about this trick and just assumed I was the last to know! Now I feel bad for not sharing it!!! Question….will you list all the fonts you own from the online store? I do have one frustration with MWP…Specs font. Do you have it? It seems to line up the letters in names really wonky. Not sure how to fix it and very frustrating! I know it’s supposed to be a whimsical font, but this almost looks strange! There is a Yahoo MWP group. I’ve been a member for a long time (maybe a couple of years?!) Their membership settings say “by invitation only” and that they are “not listed in directory.” Probably why no one can find the group. 🙁 I have no idea why they have it set this way, but it seems a shame. I’ll do another blog post hopefully today and will list what fonts I have! I am new in the monograming world so I’m interested in getting connected with the facebook. Hopefully this will be a great source and support because I need all the help I can get. If there is any other group connection I would appreciate any helpful. hi Rosemary, Thanks so much for posting this. I have been doing the spacing in layers as well, and that can be so time consuming. I love, love, love MWP – it’s so easy to use, and this tip just made things easier. Can you tell me the name of the group on FB? Would love to join! I have a question…do you or anyone have problems with the Pendant Font? Take a look at the Capital V…it does not connect at the bottom. I love this font, and I don’t use the Capital V very often, but it does look funny. I have the same font from 8Claws and EFS, and the Capital V is connected from both of those. Would love to hear if anyone else has noticed this. Thanks again for your tips! Keep them coming!! I don’t have the Pendant font, but I saw that post on FB. Is there any other font that is similar that you could swap out the V? That is crazy! Hi Rosemary, thanks so much for posting this. I love MWP, and I would always do my names in layers, when the spacing wasn’t right. I just tried it, and it really worked!! Thanks again and keep posting these kind of tips! SO SO helpful!!! Thank you!!! Thanks so much for this tip! It’s happened to me, too, and I used the layering. This will be much easier. I would also like to mention that they are SO nice at Needleheads. They walked me through switching my software when I bought a new computer so patiently. I was embarassed to call when I couldn’t figure out how to import things with the Extended Features, and the gentleman who answered the phone just chuckled and said it was kind of hard to find….Love it! Heading over to FB now. Thanks again! I am not a member of the Yahoo group – did you request to join the Facebook group? How do you join a group. I need some project ideas. Would like to see examples of other’s projects. Hi, I’m just getting started. Don’t have a tremendous amount of money . Any ideas on a type of machine that appliques and monograms ,good prices on thread, wholesale shirts for infants, appliques, software. Please Help!!! Do you have or use PE-Designs? They are the design software that usually comes with Brother sewing machines. I’ve seen tons about Sew What Pro and MWP, and I was curious why you don’t talk about PE-Designs. Thanks! I don’t have PE Design and I don’t know anything about it! I use MWP and SWP. Hi there! 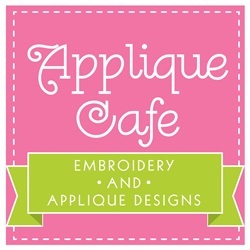 I requested to join “Applique This at That” on facebook about three weeks ago and still haven’t been added. does anyone know how I can become a member? I am NEW and have questions!! Thank you!! I am not an administrator on that page so I’m not sure? Do you use the underlay feature? When I bought it from a dealer in my area the seller recommended I always use it. Sometimes I do use underlay! Not every time though. Hi Rosemary, I hope you can help me because I don’t know what else to try. I’m trying to embroider a shirt for the owner at my kids daycare. She wants the daycare name on it. I’m using MWP, and I set my letter size at 0.35 and it is not pretty. The stiches are coming out horrible. I’ve been researching this and I’ve read that embroidering small letters is an art in itself. It shows more bobbin thread than anything. I’ve tried adjusting my tension and that didn’t help. Any suggestions? 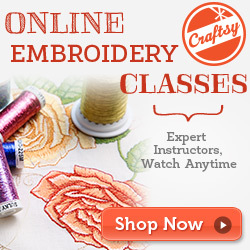 Have you ever embroidered something using small letters? Thanks! Just wanted to let you know that I got it to work. I adjusted my bobbin tension and that helped. I also changed my font and reduced the speed. So, I’m not sure which one thing I did that corrected it. But I thought if someone else reading this had the same problem, those are some things they could check. Thanks! It might be the size of the font or just the font itself being that small?? Is there any way to adjust when the name is vertical? What program are you using, if any? I have purchased some monogram designs (not applique) like hearts, stars, etc. Can I upload them to the MWP and add to them? Only if you have the Extended Features to MWP. Otherwise you’d need Sew What Pro or something to merge the hearts, stars etc in. I am new to the monogramming world and I bought a font from a website, Is there a way to open these fonts in MWP? or how do you use them? 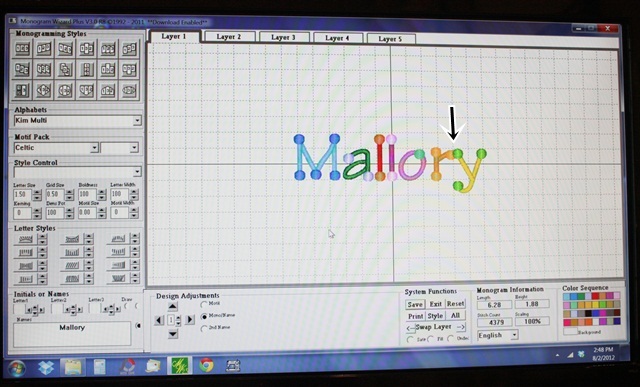 You would need merging or editing software such as Sew What Pro to open the fonts and merge the letters together. If you have MWP, you would need extended features. hi, i am totally new at this and went out on a limb and bought a used babylock emp6…after all of your great advice I have ordered all my stabilizers i will need, thread, bobbins, and im pretty sure i am good to go lol. Except for one thing, i was wondering if is absolutely necessary to buy software if i just buy designs online. Do i need software for monogramming and doing appliques? You don’t have to have software, but you are stuck w/ fonts on your machine. You would need a merging software (like Sew What Pro, which is $65 by the way) to merge bought fonts together b/c each letter is it’s own file. I would at least get something like that to merge appliques with names/initials. You also need software to be able to open an embroidery file and actually see it on your computer screen. Otherwise you are stuck w/ your machine screen to see anything. What kind of software is needed to open an embroidery file? I have MWP & winzip installed and still can’t figure out how to open the applique files I bought. 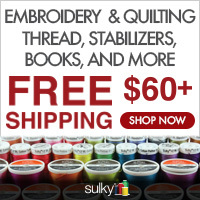 Computers don’t come with software that can “read” embroidery files, so you need embroidery software and SWP is the cheapest pretty much – $65. You can also use it to merge files! 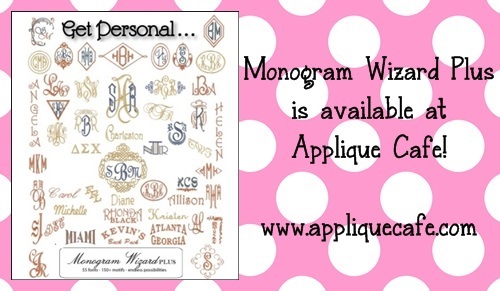 I’m thinking about getting into appliqué and monogram. What machine would you suggest? I am wanting to be able to do large pillow sham monograms and such. Also is there a machine that is more commercial type that doesn’t require a hoop? If you are wanting to do large, you will need a machine w/ 6×10 or so largest hoop size. I have a Brother PR650 6 needle and the largest hoop is 11.8 x 7.9. I’ve been researching MWP and I think I’m reading to buy it. But I’m wondering about the MWP tutorial that is available. Has anyone tried Mastering Monogram Wizard Plus, DVD tutorial? If so, is it worth buying? I’ve ready the MWP manual online and it appears straightforward for the most part but wondering if the DVD would point out things I otherwise wouldn’t know how to do. How much is the manual? I think it’s easy to use with the manual and there are Yahoo groups and Facebook pages that offer help. I’ve also posted a few tricks on my blog! You are so super helpful and I’m wondering if you can help me! I’ve been looking at MWP for a while. I have a Brother PR 650 and PE Design Next software. Would I benefit from MWP?? 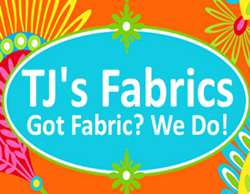 I like the option of resizing fonts and applique fonts especially but trying to figure out if I really “need” this! I am not familiar w/ PE Design Next, so I’m not sure? Does it do fonts at all?? Thanks for sharing the trick! I just download the trial version and was thinking. . . what in the world am I going to do. Now I know! Only if you have their Extended Features. I use Sew What Pro to merge. not had much time to work with this software. I saw your blog of June 24, 2013 explaining how to set up a name with the 5 x 7 hoop. In that blog you said you would have another post on Monogram Wizard Plus and explain adjusting a fon’ts width and boldness. I can’t find that blog. Would you please let me know the date of that blog. I would love to see it too. I really want to make my letters as tall and as wide as I can, but I want the letters to be thick. I am having trouble adjusting to get my letters to look correct. I have been reading every post I can get to on your blog as I have just purchased a machine and am trying to figure out the best software to purchase and how to use them all before I decide. Could you please help clarify for me… on MWP, can you only use their fonts or can you use fonts purchased off of other sites? I have downloaded the trial and didn’t see a way to import from outside the program. Thank you so much for all of the helpful information you share with us!! Yes, with Extended Features I think you are limited to 5 layers! I use Sew What Pro and you can merge in 28 letters if you want to. I’m not sure there is any way around it?? MWP EF is more expensive I believe, and you are limited to 5 layers, I THINK!!?? With SWP you can merge as many letters together as you like. No limits. It’s also only $65! I noticed the Monogram Wizard Free Demo will not let you save the file/image. How do you try it out if you can’t save it? I would like to see how it actually sews before I purchase since it’s such a big investment. I have a brother se400. Also, with SWP does it just pull from the fonts installed on your computer? How would you do a circle monogram? It seems super easy on MWP, but I have no idea how to choose the correct font or configure it with SWP. Thanks for your help. Your site has great information. I guess the MWP trial allows you to get familiar w/ the software and how it works! I bought it before trying it and love it. It’s super easy to use. SWP is used with bought EMBROIDERY fonts. Each letter is a file and it allows you to merge the letters together to form a name or initials. To do the circle font in SWP, you’d need to find the font and purchase it, then merge the 3 letters together. They would most likely be labeled LA (left A), MG (Middle G), RH (right H) etc. Or if you had MWP you could do it in there without merging. It’s easier to do names/initials. SWP is more for merging a design w/ a name, etc. and finally got the bravery tto go ahead and give you a shout out from Houston Texas! Jusst wnted to mention keep up the fantastic work! Is that a single needle machine?? What format does Singer Futura XL400 use? I think you can save to these formats: PES, SEW, JEF and JEF+ files in addition to DST files. Can you download fonts from other sources besides MWP? If so how? With regular old MWP, you have to use their fonts. You can buy disks, and now they also sell add’l fonts at needleheads.com in their online store. The fonts are downloaded and installed right in to your MWP program. If you want to buy OTHER fonts (non-needleheads), then you would have to have Extended Features to merge those fonts together. OR, I recommend Sew What Pro to merge bought fonts. It’s on our website, you can try it for 30 days free and it’s cheaper than Ext Features. You may be familiar with it! Hope that helps! If you buy a font from somewhere like esty or any other place how can you get that font on MWP? 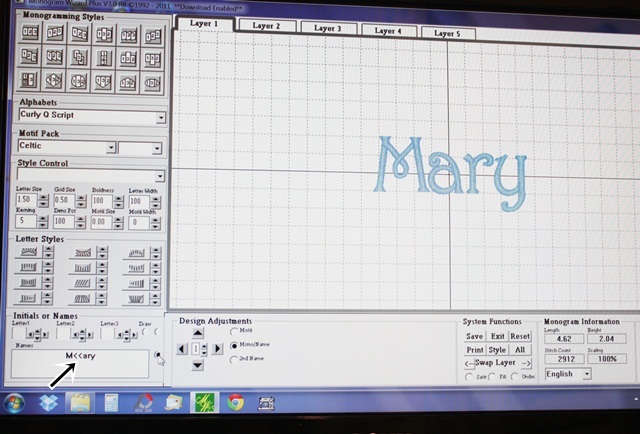 You would have to have Monogram Wizard Plus Extended Features, or a software like Sew What Pro can be used to merge those fonts together. OMG! I love you. I have been online for hours/days trying to figure out how to “interlock” my monogram. You just saved me lots of money. Love your blog, but have a question that has been bugging me. I bought the pes. file “Natural Circle Applique Font” for my machine. I unzipped the files and can get them up on the layer however I can notice the letters to get them to form a circle. They just all lay on top of each other and won’t let me drag them apart. Any advice would be so helpful!!! Are you talking about IN Monogram Wizard Plus?? I would contact Needleheads maybe!? 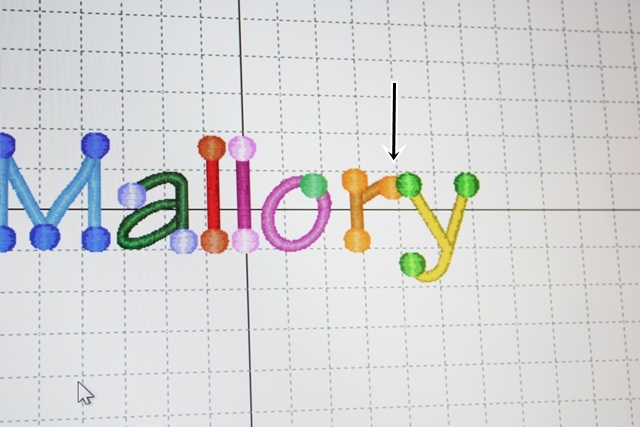 IS there a way to delete dimples that appear when stitching out large monograms? Which software are you using? Sometimes you can decrease the boldness or density. Not sure if there is a way to delete them altogether. I think it’s a “safety” feature to keep the thick monogram from pulling or getting picked! Such a blessing to find this blog! I am just learning and the letter spacing was driving me cRaZy! I knew about kenrning but it looked worse having some close and others further away. Can’t wait to give it a try! Question for you on something different…is it possible to rotate my monogram verticle? I have a brother se400 so my space is limited horizontally (4×4). I want to spell out our last name which is long and put on the back of a tshirt. So in order to do so I was going to use the large hoop and rotate image…is this even possible? Suggestions? Thank you and look forward to checking out your other blogs! YES! When you go through the save process, you first select the format. Then it takes you to a design sizing window which has measurements on it. At the bottom it says Rotate Right and Rotate Left. Or you could probably do it on your machine? Loving my new machine and MWP that I purchased from you 🙂 I wanted to see what other fonts (besides Master Circle) you use frequently? I am thinking Blackboard, Daisy and Home Run would be adorable for children’s items. Hi!!! Thanks so much for all this information! I have been using MWP for about 6 years and love it as well. I do have a question I am hoping someone can help me….when purchasing other fonts (not needlehead) like on your site or others can you merge them into MWP? If so how? You can only merge them in to MWP if you have Extended Features! Otherwise you are limited to the fonts that came w/ MWP and the ones you can add in from their Online Store! I have MWP and the extended. How do I use the extended? I don’t have Extended Features so I’m not familiar w/ how it works!? I think you bring in other files? You can do 5 layers, so you could do 5 lines if needed. I use Sew What Pro to merge my fonts from MWP (names or initials) in with an applique design. Does anyone have an issue with the “Names” and “Motifs” not appearing on the MWP? They graphically become invisible but I can see a shadow of them when I move. And there’s stitch counts. I just cant see it on my screen! Is there a way to import fonts to MWP that are not purchased from needle heads? I have the extended version and am able to import applique designs but fonts I’m haveing trouble with. Any suggestions? I think you can, but I believe with Extended Features you are limited to 5 layers? Is that correct? I use Sew What-Pro to merge fonts. You would need MWP Extended Features to import a design. I recommend Sew What-Pro which is on my home page. I merge my design in with a name or initials I’ve done with MWP. What do you use for ampersands and other special characters in MW (extended)? Hello, thank you for your info stream here. I have MWP for my Elna 8300 and haven’t had a problem these last several years. Today I’m trying to make a paragraph for a flower girl hanky. I’m having to do in the 5 layers to get everything on there. However, on Layer 4, i’m moving down the two lines to flow in the right space and part of the words stay in the original space and then draw a line down to where the two lines are moved in full. So the page has the five layers that would be fine but it still has some random words. Help, anything I can do? There are several options for how the text is shaped. Does the one that does the initials in a straight row work?? Has anyone ever had a problem with long thread lines going all over screen when increasing the boldness of the letters when doing thicker projects like blankets. When I save it with the lines, my machine will not read the design at all. I just added Natural Circle Applique font to my Monogram Wizard Plus program. I can’t figure out how to change the color of my tack down stitch. I don’t want it the same as the final satin stitch. Do you have Sew What-Pro? You could change it there. How do I create my names in all black letters using MW instead of all different random colors? You can have more than 5 layers using MW. This is how………………………………….when you finish your 5 layers, click ALL and then SAVE, them you bring in what you SAVED. This will be LAYER 1. You can then ADD 4 more layers. This can be done over & over saving each time you create 5 layers. I also use Sew What-Pro, and in there you can change the colors to all match, and you can even “join threads” so that the same colors will stitch all together without stopping. Are you using MWP extended features? ?